Show your pride and appreciation for our troops and Americans abroad by proudly displaying these ribbon magnets on your car, refrigerator, tool box, trailer or other metal objects. 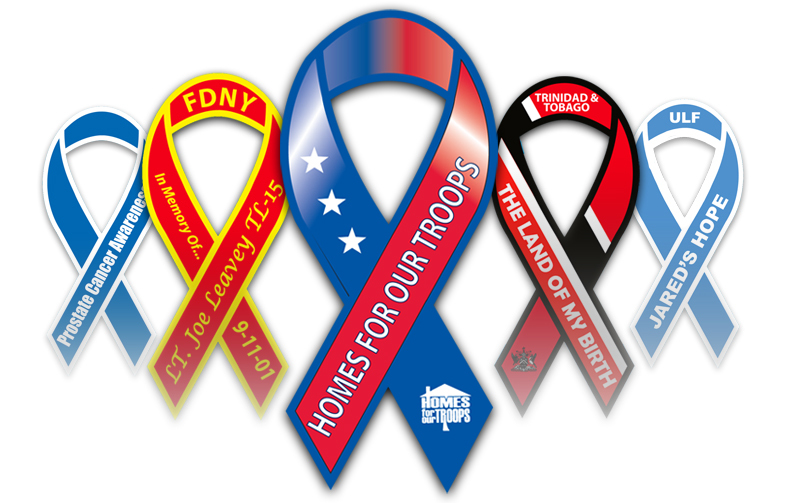 We produce Custom Ribbon Magnets as well as Stock Ribbon Magnets such as the Support Our Troops, God Bless America, and Cancer Awareness, Early Detection Saves Lives, ribbon magnets. Our custom ribbon magnets are 30 MIL thick. Printing is Silkscreen in spot colors. All colors are UV Protected to resist fading and adverse weather conditions. We custom die cut all of our ribbon magnets which insures clean cuts and tight registration. The running charges shown below include printing any one standard PMS color on a white background. For each additional imprint or background color, add 1 plate charge of 20.00 and one additional color running charge as shown below.